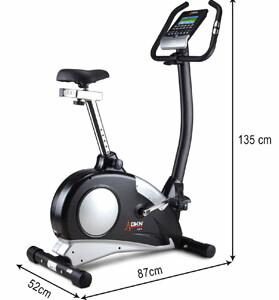 Does The DKN AM-E Exercise Bike Have The Wide Appeal Suggested In The Specification? 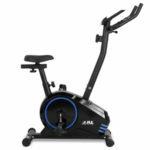 The features list for the DKN AM-E Exercise Bike is pretty extensive and while this compact machine may look fairly average on the surface, the 8kg flywheel, 32 levels of resistance, intelligent console and heart rate pulse grips suggest otherwise. This black fitness bike aims to attract users of all types and needs with its range of programmes, user modes, 140kg weight allowance and data feedback but are users impressed with what they have experienced? 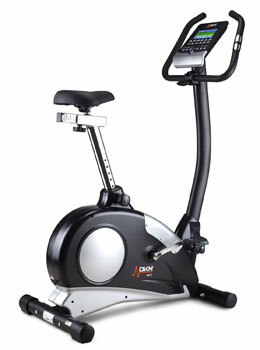 How beneficial has this DKN AM-E 32 level 8kg Exercise Bike been to owners of home gyms? There are two benefits that immediately stand out to users when they first start to ride this stationary bike – the sturdy feel that allows for a strong, confident ride and the small footprint. Both aspects are important when creating a bike for the home gym of a fitness fanatic and the combination of the frame and dimensions are a big hit. At just 87 cm long and 52 cm wide it can fit in the corner of many apartments without getting in the way. On top of this, there is praise for the different levels of magnetic resistance, the ease in transitioning between them and the lack of noise produced. The console on an exercise bike is just as important as the mechanics and buyers are generally impressed with the design and the programming options. With 12 pre-set options on-board there are plenty of ways for users to instantly get started with a beneficial program and all the information that is generated on speed, time and distance is easy to read on the blue back-lit display. This just adds to the sense of accessibility that the company have created with this bike. Pretty much anyone can enjoy a workout with this DKN AM-E bike because of the ease in getting started, the simplicity of the design and controls and the way that the indoor bike can be adjusted to suit riders of different heights. There are some experienced users enjoying regular sessions at a tough pace to make up for the lack of cycling opportunities in the winter and others making the most of the lower settings for rehabilitation. 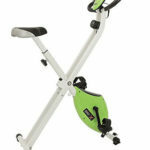 Are there any downsides to buying a DKN Exercise Bike that prospective buyers need to be aware of? At the time of writing, this product had an incredibly impressive satisfaction rating online, suggesting that there are very few faults to find in its performance. There are, however, a few reviewers that claim to offer a slightly more realistic representation of the gym bike and one of the slight drawbacks highlighted is in the construction. For the most part this is not too difficult as all the pieces fit together pretty well but some would have liked better instructions and found themselves having to re-attach the computer and its wiring. Some of the other problems mentioned are quite recognisable to consumers that have browsed other options, such as the lack of comfort in the seat and the potential for inaccuracies in the heart rate sensors if hands become too sweaty, but there are more product-specific issues within the console. For some buyers, there are just not enough options on the display and they criticise the lack of a pause button and an on/off switch – small omissions that would make the bike even more convenient. Summary: does this lack of any major criticism mean that the DKN AM-E Compact Exercise Bike is a highly recommendable option for your home gym? 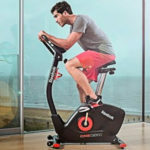 A number of the criticisms that have been made about this gym bike are very familiar and do not really do all that much to turn prospective buyers away – heart rate monitors, instruction manuals and saddles will be problematic wherever you go. With these issues to one side, there is little directly targeting this design and this reinforces the idea that this a definite crowd pleaser. With a few more options on the console, the product could perhaps come a lot closer to being a 5 star option but, for now, it comes close enough with its numerous benefits. If all you are looking for is a basic home exercise bike that can offer reliable resistance settings, a sturdy feel, helpful programming and, above all, great accessibility for all members of the household, the DKN bike is definitely worth a second look. Find more reviews about the DKN AM-E Exercise Bike on Amazon here.